Is Johnny Weir Too Gay for 'Stars on Ice'? That would be impressive. GLAAD says the Lady Gaga-loving Olympian was excluded from the money-raking figure skating tour because he is "not family friendly." GLAAD has learned from a source that wishes to remain anonymous that sponsors of the Stars on Ice Tour, which include Smuckers and IMG Entertainment, have refused to allow 3-time US National Champion and 2-time Olympian Johnny Weir to participate because they claim that he is "not family friendly." To say that Weir is "not family friendly" would be a clear jab at his perceived sexual orientation. Weir is extremely involved with his family. He is putting his younger brother through college, and supports the family financially because his father's disability prohibits him from working. 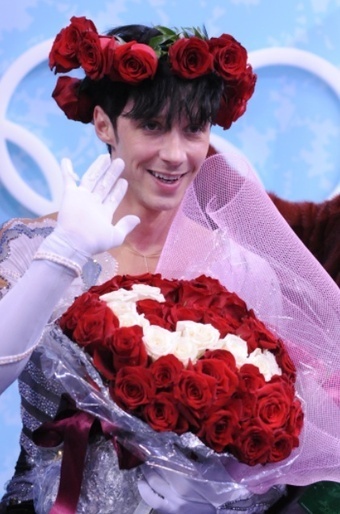 [...] Weir's performance and costume style is sometimes considered flashier than those of other skaters, leading to questions about his perceived sexual orientation.